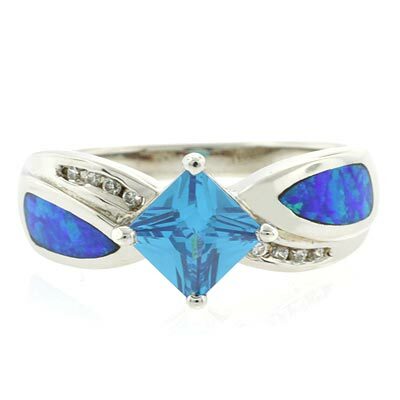 A beautiful sterling silver opal ring plated with rhodium. With a princess cut blue topaz as center stone, blue opal and simulated diamonds guarding it, this becomes a charming and delicate ring perfect for any occasion. Blue Topaz Silver Ring made with .925 sterling silver and a rhodium finish to give it a white gold look.